House hunting in the NCR is akin to a picnic— take the day off and visit several properties and property dealers, haggle till your tongue drops off and then haggle some more. BT reporters go incognito across five cities to find out what’s the best deal your money can buy against a developer’s listed price. House hunting in the NCR is akin to a picnic— take the day off and visit several properties and property dealers, haggle till your tongue drops off and then haggle some more. My first stop: Eldeco Utopia in Noida’s Sector 93, just off the Expressway. Inside the on-site marketing office, I quickly get down to business: that I am a bona fide house hunter looking for a minimum three-bedroom apartment. The sales officer offers me three-bedroom plus servant room units that are ready-to-move-in. I cut directly to the chase: damages. “Rs 1.24 crore is the basic sales price (BSP), plus extra charges like car parking, preferential location charges (PLC), etc.,” he says. This, for a 2,150 sq. feet apartment (Super Area)—which would work out to approximately 1,500 square feet carpet area. While a down payment would fetch me an 8 per cent discount (a teaser, as I discover later), installments make me eligible for only 4 per cent. “Rs 1.24 crore is a bit on the higher side,” I tell him, especially since I figure that apart from the Expressway, there’s not much this apartment can boast of. No nearby provision stores or markets, no easily available transportation, no education or medical facilities, I argue. He responds with future prospects and valuations—I stick to the present. He throws in another 4 per cent—I am now up at 12 per cent discount and hungry for more. “What’s your offer?” he queries. I quote Rs 80 lakh. He baulks, but adds another 4 per cent to the discount basket—making me richer by 16 per cent. Round it off to 20 per cent, I suggest. Clearly, he’s a little weary now and hesitatingly accepts. It’s not much, but it’s a start. Next halt, the under-construction Omaxe Grand Woods and Omaxe Forest Spa, also in Sector 93. The company’s already discounted the listed price of Rs 7,100 per sq. feet for a 2,900 sq. feet three bedroom apartment at Forest Spa by Rs 900 per sq. feet. “If you opt for a down payment, there’s a further rebate of 10 per cent,” informs the smooth-talking company representative. A price of Rs 5,580 per sq. feet even before I start talking. Greedy, I push for more. He needs authorisation from company for more. At the Omaxe Twin Towers, in Noida’s Sector 50, a three-bedroom plus servant room 2,150 sq. feet apartment is offered for Rs 4,950 per square feet—a measly discount of 10 per cent. I protest and gingerly he reaches out to his calculator and punches in a few numbers. Rs 4,851 per sq. feet, he comes back. I push for more—and the outcome is Rs 4,800 per sq. feet. I know there’s more juice left and the company representative confirms it with his parting shot: “If you are willing to write a cheque right now, we could negotiate something to your liking.” I smile—mission nearly accomplished. Indian it’s el dorado, Gurgaon, is a living example of an idiot-proof city—with little by way of signages and infrastructure, it ensures that idiots and directionally challenged people stay away. Searching for DLF Royalton, I manage to chance upon the nearing-completion Connoisseur Apartments in Sector 43, right next to the Gold Souk. The 2,500 sq. feet four-bedroom apartments, as I learn, come with an asking price of Rs 6,400 per sq. feet—and I am offered an all-inclusive price of Rs 1.65 crore. Sure, it includes all woodwork, modular kitchen and air-conditioning, but the eight figure digit is way too much, I reason with the company’s representative. It’s a sign of the times that realtors are amenable to prices suggested by customers—he suggests a discussion on the price. While I start with Rs 1.1 crore, he responds with Rs 1.55 crore. I quote Rs 1.3 crore—he suggests a teleconference with his MD Anil Sharma, who’s unwilling to go below Rs 1.4 crore. Fobbing them off, I head towards DLF’s Royalton Towers where a software firm owner, probably singed by the heat of the meltdown, wants to get rid of his fourbedroom 3,900 sq. feet apartment. His asking price: Rs 6,000 per sq. feet. It’s probably been bought as an investment, so you could negotiate, suggests the broker. I check a few other properties—Vipul’s Belmonte on Golf Course Road, where a four-bedroom 4,100 sq. feet apartment is quoting at Rs 5,800 per sq. feet, DLF’s Belaire, launched at Rs 6,000 per sq. feet for a fourbedroom 3,200 sq. feet apartment, fell to Rs 5,600 per sq. feet and has stabilised at Rs 5,800 per sq. feet. I check into a local real estate consultancy, Temple Estate and Securities and get talking to Anant Bawa, CEO, Gurgaon-Residential. There’s been a softening, he confirms, but only to the extent of Rs 100-200 per sq. feet in most cases with a few exceptions like the Ridgewood Estate where a three-bedroom 1,400 sq. 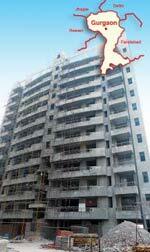 feet apartment went for Rs 76 lakh vis-à-vis an asking price of Rs 84 lakh a few months back. He suggests if my budget is in the region of Rs 4,000 per sq. feet, I should probably look at apartments on Sohna Road. As I make my way out of his office, his sales executive motions me aside. “If you’re willing to wait for a month, I can assure you prices around this part (DLF Phase 4 and 5) will be down by another Rs 1,000-1,200 per sq. feet,” he informs. My Gurgaon trip hasn’t gone waste after all!